As the architectural gaze increasingly focuses on sustainability, it’s no surprise that timber structures are very much in vogue amongst a creative group of architects pushing the boundaries of what can be achieved with this most natural of materials. WE Architecture, a young, innovative practice based in Copenhagen, Denmark is so called for the philosophy that architecture is not the result of only one person’s stroke of genius. 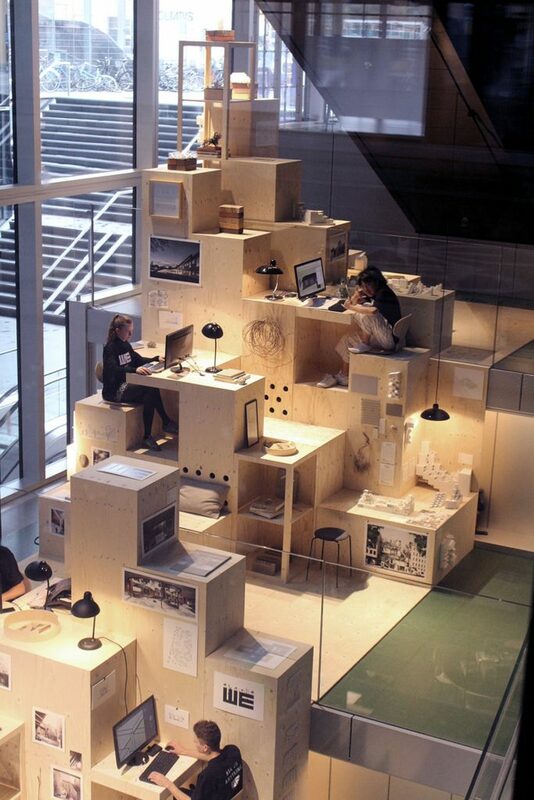 It recently created a “playful office landscape” at BLOX, one of Copenhagen’s major urban redevelopment areas. The installation formed part of the Dreyers Fond (a philanthropic organisation) and Danish Architecture Center (DAC) project at BLOX to create a gathering point for Danish architecture, design and new ideas. The project saw the creation of a “Staircase Gallery”, showing the next wave of Danish architecture conveyed by a number of talented and distinguished young Danish architectural companies. BIG architectural practice boasts offices in Copenhagen, New York and London where designers, urbanists, landscape professionals, interior and product designers, researchers and inventors bring their ideas to life. BIG has collaborated with office space business WeWork to create the very first WeGrow school in New York City. The interactive learning landscape is designed to embed the values of a conscious approach to education, nurturing the growth, spirit and mind of the 21st century child. The 10,000sq ft learning “universe” is for children aged three to nine and located in WeWork’s HQ in Manhattan’s Chelsea neighbourhood. 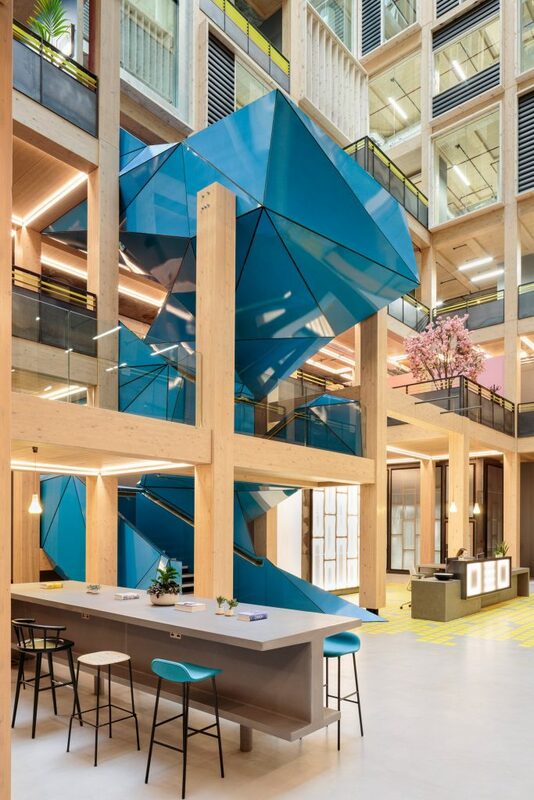 Studio RHE is behind the insertion of a nine-storey timber structure that adds new commercial floorspace and new spatial connections between floors at the redeveloped The Import Building, which was originally built in 1990. Constructed from engineered timber, in combination with modularised timber-framed, glazed facades, the new natural material palette contrasts with the rawness of the exposed existing concrete structure. Studio RHE says Timber was selected for its “high sustainability credentials but also for its malleable qualities”. The atrium features multiple balconies, with timber frames that cantilever into the central space. Light floods in from above, thanks to a large skylight overhead.